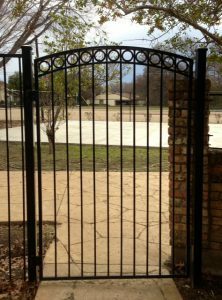 Bobcat Custom Outdoors offers a large selection of Ornamental Iron Gates and Fences. From Iron walkway gates, to custom garden gates, our beautiful selection of iron works will fit any home’s needs… and budget! We use a wide variety of sizes and styles so your professional sales consultant can design a custom solution for you, or come up with a ready made design. We can offer you a wide variety of colors from oil based satin finishes to powder coated finishes. We can match roof, window and brick colors as well making our services very specialized for your needs. Bobcat Custom Outdoors uses heavy-duty adjustable bolts and bearings to keep your gate operating quietly and soundly for years to come. Our gates are built to last and withstand our harsh Texas summers. When it comes to Iron Fences and Gates, not all contractors are the same. Bobcat Custom Outdoors stands out from the rest, with quality, craftsmanship and affordability. Contact Bobcat Custom Outdoors today and speak with a specialist about your next project. You will appreciate our approach and value our expertise. Contact us today!